Create a pair of custom photo cufflinks with your own photos or images. 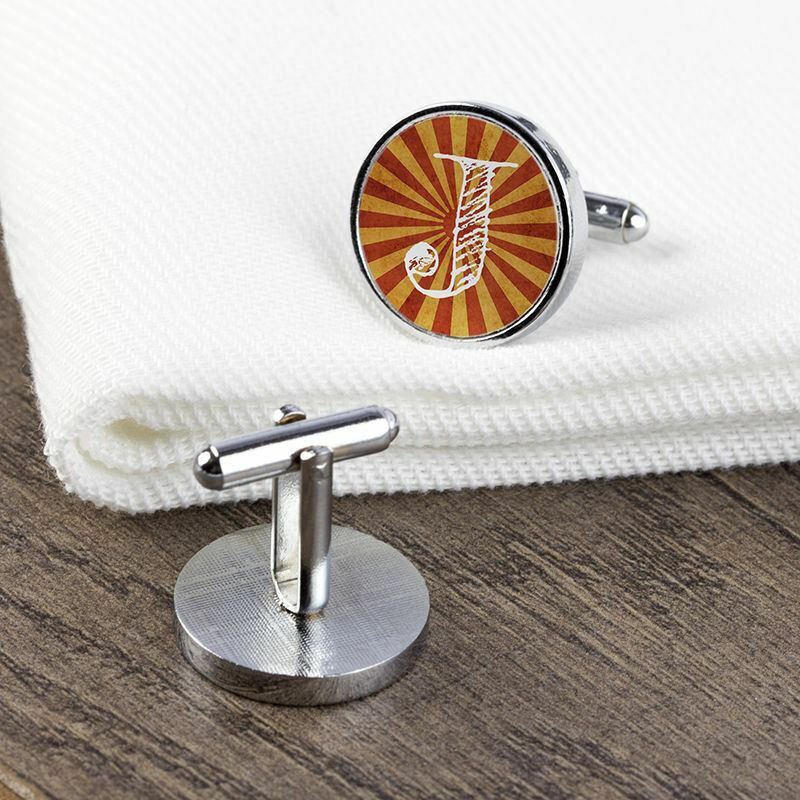 Our personalized cufflinks are the perfect gift for any man in your life. Make them identical, or each one different, design them the way you want! High quality and sure to impress. Design your custom cufflinks with your initials, or personal photos. Add a personal touch of class to your wardrobe with a pair of personalized cufflinks. Our custom cufflinks also make the perfect gift. Whether it is a wedding, birthday, or Father's day, a pair of personal cufflinks is a heart-felt gift that is sure to impress. I bought a pair of custom cuff links. I had an issue with one of them. They send me a brand new set of them super fast. They look great. I would highly recommend them. I ordered a photo pillow case and a set of cufflinks for Christmas. I was impressed at the processing time! Often when you order a custom photo item you need to do it far in advance of when you need to item. Bags of Love was very fast with their production and I created, ordered and received my items within a week. Both items were exactly as I had hoped and both recipients LOVED their custom photo items. Beautiful quality cufflinks ! Will definitely order again! We loved the results of our order! We are amazed that the production is so fast, and that we can order one item at a time, not a bulk lot, so we can use them as one off gifts. The photos we used translated amazingly and we think the gifts are stunning. Create the perfect gift for a special man in your life. A pair of custom cufflinks is a great way of presenting one’s self with sense of unique professionalism. Create a pair to match a specific suit, or design a fun pair. The choice is yours, designed by you for your needs! Please note: Our Personalized Cufflinks are made from metal, which has a slightly worn finish. This gives the cufflinks a charming rustic, almost antique quality, which adds to their individuality. The hidden parts of the cufflinks may present mild traces of oxidation over time, this is to be expected. Polish regularly to keep them shiny and pristine. They come in a lovely black box with a white trim and lined with satin. When not in use, this is the ideal place to keep them secure and free from dust. We print your photos onto a glossy surface within the round or square cufflinks. Your designs won't fade over time or scratch off, as we use a specialist technique that creates a long lasting print. They're hand finished to an exquisite quality, ensuring your recipient will fall straight in love with their new stylish accessory. As each item is bespoke and handmade to order, the post and toggle clasp may vary slightly in shape and size, this will not impact the overall look of your cufflinks, or affect their usage. We print your photos onto a glossy surface within the round or square cufflinks. Your designs won't fade over time or scratch off, as we use a specialist technique that creates a permanent, long lasting print. They're hand finished to an exquisite quality, ensuring your recipient will fall straight in love with their new stylish accessory. As each item is bespoke and handmade to order, the post and toggle clasp may vary slightly in shape and size, this will not impact the overall look of your cufflinks, or affect their usage. The actual printable area is very small, measuring only 0.71" diameter or 0.59" square. Images that are extremely wide in nature will be difficult to scale to proportion, so please use the design interface to view and edit your design. A popular way to decorate your cufflinks is with initials on a colorful background. This is a sleek and smart design that is perfect for both work and play. Treat your dad to a special pair of Christmas cufflinks, personalized with funny photos from past festivities. It can become a family tradition that he wears them on Christmas day, or the whole holiday period, to help spread the festive cheer. If your partner has recently got a new job, a pair of cufflinks personalized with their initials is the perfect gift to say congratulations. It will help make a lasting professional impression and shows that they mean business. If you are getting married, a personalized pair of cufflinks makes a wonderful gift for the father of the bride. Everyone considers the maid of honor, and the best man, however, the father of the bride can often be difficult. A pair of custom cufflinks would make a wonderfully sentimental memento. Design your own wallet with your favorite memories. Choose from real leather or oilcloth.